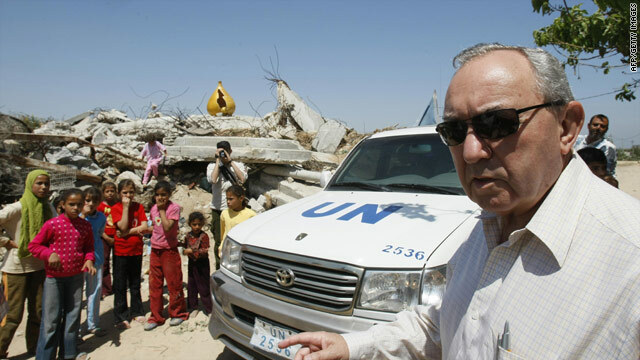 U.N lead investigator Richard Goldstone inspects damage inflicted on homes in Gaza during the offensive of 2008/2009. (CNN) -- Israel has paid the United Nations $10.5 million for damage to its facilities during last year's offensive against militants in Gaza, the U.N. said Friday. During the three weeks of fierce fighting, Israeli shells set ablaze the U.N.'s main aid distribution warehouse in Gaza City and also attacked three U.N. schools for Palestinian refugee children, the U.N. said. A U.N. board of inquiry investigated the incidents and released a scathing report about it last May. In the report, the U.N. board of inquiry blamed Israel for the damage during the military offensive between December 2008 and January 2009. Shortly after the report was released, Israeli President Shimon Peres said his country's military had made "mistakes," but said the offensive was aimed at stopping the firing of rockets into Israeli towns from Hamas in Gaza. "With this payment, the United Nations has agreed that the financial issues relating to those incidents referred to in the terms of reference of the Board of Inquiry are concluded," Secretary-General Ban Ki-moon's spokesman Martin Nesirky said Friday. "The Secretary-General would like to record the cooperative approach that the government of Israel has shown in the course of the discussions that led to this settlement." Comment from the Israeli government about the payment was not immediately available.